What’s going on here you ask? Why is the Lone Wolf not at Starbucks, and instead interacting with an item from the Marvel Universe? 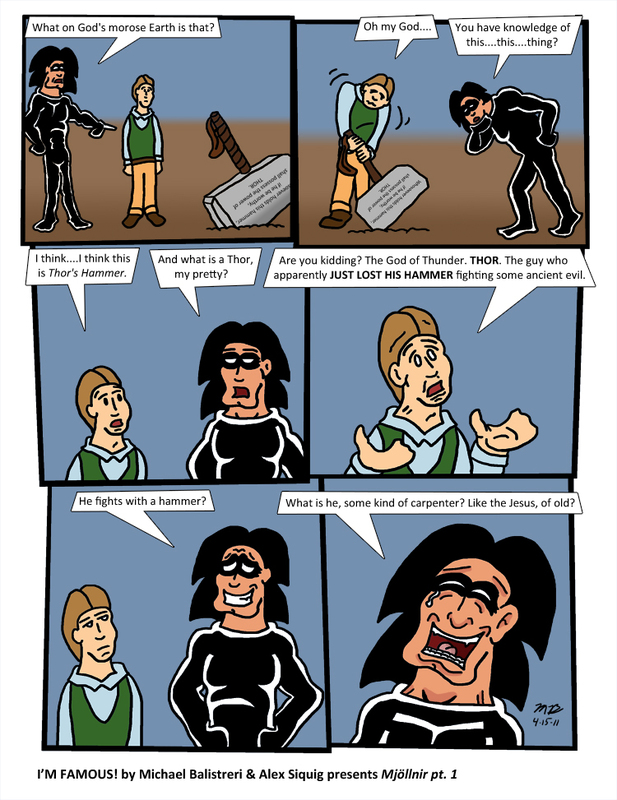 Because, this is a two page entry into a contest where you had to feature Thor’s hammer, as a tie-in to the atrocious looking movie about to come out. I’ve never understood why Thor was a Marvel “superhero”, or why he’s part of the Avengers. Nothing about it makes sense to me, as he obviously doesn’t fit in. Perhaps even more baffling is how Thor is apparently so popular. He needs his own movie? He has like 10 different titles on the shelves every time I go to the comic book store. Where are all these Thor fans? Make no mistake, I like Greek mythology, and am fairly well versed in it (I did take an honors course on the subject in college), so I do like the source material. I just don’t understand Marvel’s (mis)use of it. Oh well. So why did I enter a contest for Thor? Because I like contests, and thought this one sounded fun. Also, Alex was interested in it (as much as he mocks it, I think he secretly likes Thor). So that’s the story. 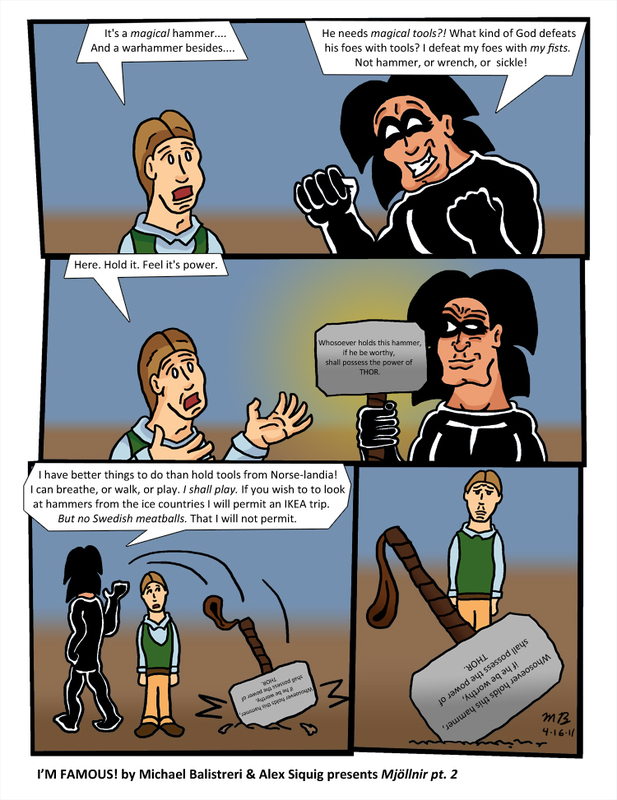 I kind of came up with the initial idea that the Lone Wolf and Eric would just find Thor’s hammer and make fun of it, then Alex wrote it. I think he did a really good job. The jokes in this crack me up. I love the Lone Wolf’s overall irreverence for most everything, and that really shines here. People have described our comic as having incredibly dry wit, and I think a lot of that is because Alex and I are pretty irreverent, especially when we get together and make fun of things. In many ways I’m Famous! is just an extension of the way Alex and I joke around together and mock virtually everything. I drew these very quickly. I plotted them out at the same time as I worked on number 100, and I really cranked all three out in short succession. It was shockingly easy, really. Either I’m getting better, or just more complacent. Actually they weren’t super quick, and I put a lot of work into them, they just felt fast and didn’t really have too many problems. They didn’t take long though. I hope you see I put some detail into capturing Thor’s hammer, like putting Marvel’s inscription on it and replicating the look. Also look at the title of the comics. In case you don’t know, that is the name of Thor’s hammer. So worry not, the Lone Wolf’s journey at Starbucks will continue next, though I think I will draw the next Black Power first. So lots more for you silly fans to look forward to!